【RAZOR SHARP FILLET KNIFE】-- RING SERIES kitchen knives have always been favorite collection by chefs all around the world for it's Razor Sharp edge, rust free & corrosion resistant. 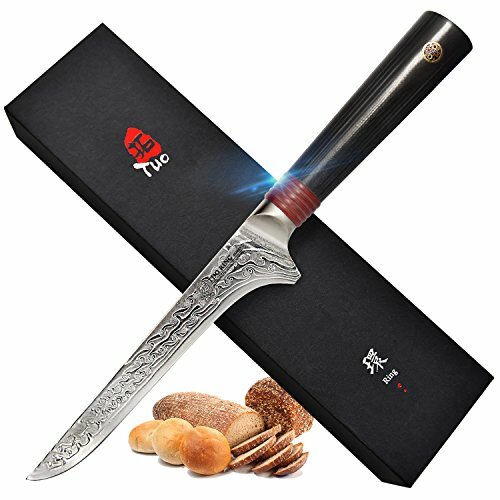 The Premium Rose Damascus steel ensures long-lasting sharp, visually stunning, beauty as well as excellent performance in kitchen. 【HIGHLY DURABLE BLADE】-- Imported from Japan, each blade is separately tempered, honed to a blisteringly sharp 8-12 degree per side using the traditional 3-step Honbazuke method by many experienced craftsmen.This can maintain a high durability which will not be rust or dull even after using it for a long time. 【JAPANESE AUS-10 DAMASCUS STEEL】-- Imported from Japan, premium AUS-10D high carbon damascus steel as core of the blade, combined with lost of layers high carbon softer steel on each side, creating beautiful rose pattern on blade, in the mean time, providing added strength, a high level of rust-resistance, wear-resistance, long-lasting performance and a maximum sharpness. Hardness reach to 62. 【ERGONOMIC G10 HANDLE DESIGN】-- An ultra-premium G-10 handle of military grade strength for life-long durability, achieving highly impervious to heat, cold, moisture. To ensure perfect ergonomic design, each handle undergoes a rigorous nine-step finishing process. 【100% SATISFACTION OR MONEY BACK GUARANTEE】 --We promise a superior product that will give you a lifetime of exemplary service, try it risk free, we know you'll love it! With the luxury packing it is also the wise choice as a gift (Christmas, weddings, birthdays, fathers day, mothers day), for culinary students, home cooks, professional chefs and more.